Ogham is an intricate language developed by the Celtics to interpret the symbolism of the trees. The trees are deeply connected to all aspects of life and serves as the lungs to our planet. Ancient people felt their connection to the universe offered them insight into the world around us. The basis of the Ogham belief, therefore, is that nature could be used as a way to understand the cosmos, and that information is applicable to our lives. The Celtics saw the trees as each holding a unique meaning and specific values. They then developed an alphabet of twenty characters where each letter represents a different tree. Celtics felt that the connection between trees and animals was intrinsic, as they provide food and air to Earth’s wildlife. This connection was made apparent in Ogham by assigning an animal to each tree. The symbolism of these animals becomes significant when we begin to see them often. We seek to understand their particular symbolic meanings in hopes of gaining a deeper understanding of the messages being sent through the cosmos. As everything is connected, messages are passed down through the trees and the animals that serve to represent them. Perhaps when an animal is at the forefront of your mind, or is seen in your daily life, there is a greater meaning to be derived from that. Let us examine the specific meaning of the Eagle, which is associated with the birch tree. Animals are assigned to concepts that they personify. In the example of the eagle, we can easily imagine the associated values and traits. As a fierce predator and protector, the eagle symbolizes strength, security, leadership, dexterity, focus, and authority. The meanings associated with the eagle are extensive, and these are only a few of the potential messages an eagle can portray. For that reason, it is important to have a high level of self-awareness when interpreting these signs. The greater understanding you have of your situation, the easier it will be to see how the eagle can be applied to your life. One potential symbolic meaning the eagle might be attempting to transmit is of focus and intelligence. The eagle is sharp in both its mental abilities and its appearance. It can therefore serve as an emblem of higher thinking. It can be a sign to sharpen your own mind through new challenges. These aspects of the eagle can also be applied to problem-solving. An eagle seeks out its prey and apprehends it in a swift motion. The eagle is clever and direct. In what aspects of your life might you need to apply this? Consider the ways you can maximize efficiency in you work or personalize. Perhaps it is time to take the direct approach when dealing with a problem. The eagle is fearless. It approaches life head on, and emerges triumphant. Adopt the sharp focus and strength of the eagle to soar to new heights in your life. As all living things share a connection, you are connected to the eagle. Like the eagle, you can be strong and self-assured. You can act with confidence and dexterity. 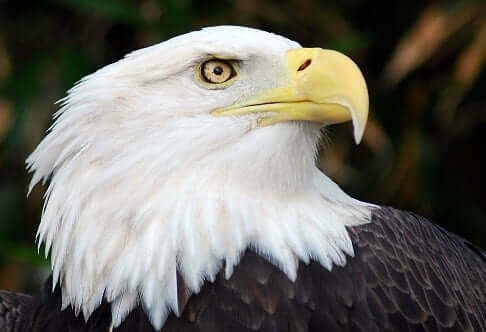 At this stage in your life, take some time to meditate and visualize the eagle in order to achieve a greater understanding of the animal and its role in your life. Reflect on its characteristics and discover how you can use their wisdom.